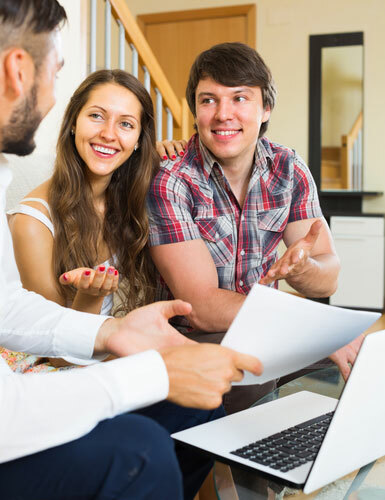 Buying your first home can be both an exciting and daunting experience and all first home buyers need expert advice and support from someone they can trust. At Assured Lending, our Mortgage Brokers will help you get started and give you all the support you need to make smart decisions for your future. We can give you some initial advice over the phone and are happy to make a free appointment with you, either during or outside of office hours. We understand that purchasing your first property is an emotional and often scary process. We take the fear away and give you the confidence to make informed decisions with expert advice and support. If your purchasing your first property, you need to take into consideration all the costs that will be involved, not just the cost of the property. Click here to see what costs you may be required to pay. This is the most important thing you need to know before you start looking at property. How much you can afford to borrow will depend on your current income, your assets, your living expenses and the deposit you have saved. You can get an estimate on how much you can afford to borrow and what your repayments will be using our online Affordability Calculator. The maximum amount most lenders are prepared to offer for an owner occupied home is 95% Loan to Value Ration (LVR). This means your total loan amount, including all fees, cannot be more than 95% of the value of the property. If you are able to save a larger deposit, you will have more choice with which loans you can apply for and you will be able to get a lower interest rate on your loan because there is less risk to the lender. If your loan is more than 80% Loan to Value Ration (LVR), you will be required to pay Lenders Mortgage Insurance which is a one off fee paid to the lender as insurance against your loan. This fee will be added to your total loan amount. If you need help to calculate the minimum deposit you require for a property purchase, give us a call and we will have an experienced mortgage broker do the calculations for you. A home loan pre-approval is a conditional approval by a lender to loan you up to a set amount of money, as long as the property you purchase meets the lenders valuation requirements. A pre-approval gives buyers a realistic budget to work to when looking for a property and is essential if you are considering purchasing at Auction. Most pre-approvals are valid for 3 months and can be renewed if you don’t find a property in this time. A pre-approval does not cost you anything and can be arranged by an Assured Lending Mortgage Broker with over 20 of Australia’s leading lenders. The First Home Owner Grant in NSW was established to assist eligible first home owners to purchase a new home. Changes to the First Home Owners Grant which take effect on 1 July 2017 offer a $10,000 first home buyers grant for people building a new home with a purchase price of up to $750,000 or purchasing a new home with a purchase price of up to $600,000. The government gives you the First Home Owners Grant in the form of cash to add to your deposit and this is usually paid at the time of property settlement or if your building, when the slab is poured. As well as the NSW First Home Owner’s Grant, first home buyers are also entitled to exemptions or concessions on stamp Duty. No stamp duty on both new and existing homes up to $650,000 and reduced stamp duty for new and existing homes between $650,000 and $800,000. Purchasing your first property can be an emotional experience for many buyers so it’s important to analyse what your needs are before you begin your search. Your property should meet as many of your needs as possible as well as being a good investment in your future. First home buyers are usually on a tight budget so think about which needs must be met and which ones you are prepared to be flexible on. Download and print a copy of our free Property Viewing Checklist to take with you when you look at potential houses to purchase. If you find a property you believe may be a good investment, Assured Lending would be happy to provide a free online property report if it is a residential property located in NSW. Click here to order your free report today which will include an estimated valuation on the property, previous sales history, location highlights, comparative sales details for similar properties that have been sold in the same area, median property prices for the suburb, properties sold per year in the suburb, capital growth and more. Once you’ve found a property, inspected it several times to make sure you are certain and obtained an online property report from Assured Lending, it’s time to make an offer. Get a copy of the Contract of Sale from the Real Estate Agent. You need to hire the services of a conveyancer or solicitor to look over the contract of sale to make sure everything is correct. Your contract of sale will include a zoning certificate from the local council, a copy of the title to the property from the Land Titles Office and copies of documents outlining other registered interests over the property. Inspections will cost around $500 – $600, but they are essential to have done prior to making an offer and signing contracts. These inspections will let you know if there are any termites or other pests within the property or if there are structural issues that could cost you a lot of money to repair. These need to be taken into consideration when negotiating a purchase price for the property. Try not to appear too keen when making an offer on a property and be prepared to negotiate. Your initial offer should be lower than the actual price you are prepared to pay so you have some room to negotiate. You also need to ensure you advise the real estate agent of any terms you would like with your offer such as time frame to move in. Once you have agreed on a price, you will need to pay a deposit and sign the contract of sale. Until this is completed, the property can be sold to someone else. Once contracts are signed, you will need to get your loan unconditionally approved. Your lender will need to have a valuation done on the property and you will need to have the property insured. Your personal Mortgage Broker at Assured Lending will help you with this process to make sure all the paperwork is done and the loan is approved and ready for settlement. The duration of the Settlement will be advised in your contract and can be negotiated. In NSW this is usually around 6 weeks. Prior to settlement, you are entitled to have one last inspection of the property to ensure it is still in the same condition. The balance of the property purchase is paid by your Lender on the last day of settlement and keys are exchanged. Once you have selected a property and signed a contract of sale, we will put together the paperwork for an unconditional loan approval. Download our free comprehensive Home Loan Guide packed with valuable information, checklists, resources and home buying tips to help you navigate the process of getting a loan and buying property in Australia. Would you like a free report on a property you are considering purchasing? Your property valuation report will include an estimated valuation on the property, previous sales history, location highlights, comparative sales details for similar properties that have been sold in the same area, median property prices for the suburb, properties sold per year in the suburb, capital growth and more. Download this free report which has all the latest news & statistics for the housing market in Australia. Includes average home values by state, capital gains, housing supply & demand, auction clearance rates & much more. Access our obligation free mortgage affordability calculator to get an instant estimate on how much you can afford to borrow. This calculator will also tell you what the monthly repayments may be on the loan amount and how much interest you might pay over the life of the loan. Calculate how much you will need to save each week to reach a set savings target. This calculator will also tell you how much interest you could generate on your saving and the amount of time it will take to reach your goal. Print our property viewing checklist so you can ensure you are considering all aspects of a potential property during a viewing. This checklist could save you a lot of time and money making sure the property is in good condition. Calculate what the stamp duty will be for a property you are considering purchasing. Stamp duty is a tax required to be paid when purchasing land or property and is calculated on the value of your investment. Stamp duty varies between the different states in Australia. Get a clear understanding of your current finances with our personal budget planner. Use this calculator to see if your finances are in surplus or shortfall and get a better idea of how your budget may look once you have purchased a property. We take uncertainty out of buying your first home with expert advice and support from start to finish.